"Do you know what makes a real hero?" Warner Bros has debuted the first teaser trailer for the big screen, feature version of the "Teen Titans" animated superhero series, titled Teen Titans Go! To The Movies, hitting theaters this July. "Teen Titans Go! to the Movies finds our egocentric, wildly satirical Super Heroes in their first feature film extravaganza — a fresh, gleefully clever, kid-appropriately crass and tongue-in-cheek play on the superhero genre, complete with musical numbers." The voice cast includes Will Arnett and Kristen Bell, plus Greg Cipes as Beast Boy, Scott Menville as Robin, Khary Payton as Cyborg, Tara Strong as Raven, and Hynden Walch as Starfire, reprising their roles from the series. This looks very funny, as expected. The Wonder Woman gag in this is pretty good, along with all the meta-jokes. Enjoy. When the Teen Titans go to the big screen, they go big! It seems to the Teens that all the major superheroes out there are starring in their own movies—everyone but the Teen Titans, that is! But de facto leader Robin is determined to remedy the situation, and be seen as a star instead of a sidekick. If only they could get the hottest Hollywood film director to notice them. With a few madcap ideas and a song in their heart, the Teen Titans head to Tinsel Town, certain to pull off their dream. But when the group is radically misdirected by a seriously Super-Villain and his maniacal plan to take over the Earth, things really go awry. The team finds their friendship and their fighting spirit failing, putting the very fate of the Teen Titans themselves on the line! Teen Titans Go! 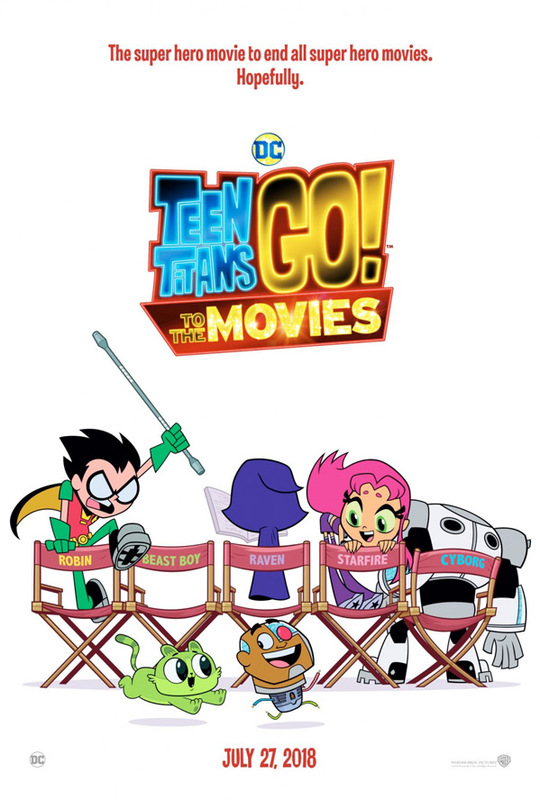 To The Movies is directed by filmmakers Aaron Horvath & Peter Rida Michail (both of the "Teen Titans Go!" series). The screenplay is by Aaron Horvath & Michael Jelenic. Warner Bros will release the movie in theaters everywhere starting July 27th, 2018 this summer.